Does it seem like you spend hours and hours in the gym, yet never seem to lose more than a couple pounds of body fat? Welcome to the weight loss "purgatory" that millions of people find themselves trapped in. Not to worry. Below I'll share with a you a few proven solutions for getting great fat loss and fitness results in the gym as quickly as possible. 1. Eat a clean diet outside of the gym. A poor diet is without a doubt the biggest reason why people aren't able to lose weight and see good results from their time spent at the gym. If you're eating lots of refined sugars, processed carbohydrates, fried meats, etc. 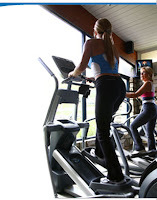 you're simply not going to lose more than a few pounds, no matter how many hours you spend on that elliptical machine! 2. Do some full-body circuit training. The wide variety of cardiovascular and resistance-training machines and options found in a typical gym is one of the biggest benefits to joining one. One of the best ways to lose weight -- in or out of a gym -- is to do full-body circuit training that involves compound/multi-joint strength exercises (e.g. squats, pullups, bench presses, etc.) and interval-based cardio exercise (e.g. a 10-minute "hill running" programming on the treadmill). Too many people get distracted by non-productive things when they're in the gym. The biggest examples are televisions and other people. One of the best ways to lose weight is to keep your workouts short and intense. That's very difficult to do when you're watching Oprah and/or having an in-depth conversation with the nice lady on the next exercise bike over. So there you go: 3 of the best ways to lose weight in the gym. Keep them in mind next time you're in the gym and you just might be able to start burning off that ugly belly fat and a much faster rate!